Actos (Pioglitazone) is used to treat type 2 diabetes by reducing the resistance your body has to insulin. IMPORTANT NOTE The following information is intended to supplement, not substitute for, the expertise and judgment of your physician, pharmacist or other healthcare professional. It should not be construed to indicate that use of the drug is safe, appropriate, or effective for you. Consult your healthcare professional before using this medication. Each brand name is a registered trademark of it's respective drug manufacturer. Actos Common Uses: Actos (Pioglitazone) is used to treat type 2 diabetes by reducing the resistance your body has to insulin. It is used either alone or in combination with other anti-diabetes medicines, including metformin or insulin, as part of a diet and exercise program. How to use Actos (Pioglitazone): Follow the directions for using Actos (Pioglitazone) provided by your doctor. 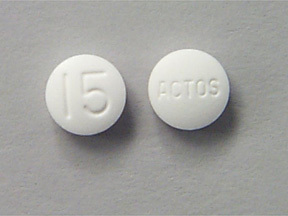 Actos (Pioglitazone) may be taken on an empty stomach or with food. STORE Actos (Pioglitazone) at room temperature at 77 degrees F (25 degrees C) in a tightly-closed container, away from heat, moisture, and light. IF YOU MISS A DOSE OF Actos (Pioglitazone), take it as soon as possible. If it is almost time for your next dose, skip the missed dose and go back to your regular dosing schedule. Do NOT take 2 doses at once. Actos Cautions: DO NOT STOP USING Actos (Pioglitazone) or other diabetes medicine without first checking with your doctor. CHECK WITH YOUR DOCTOR before adjusting the dose of your diabetes medicine or changing your diet. IF YOU ARE TAKING Actos (Pioglitazone) WITH OTHER DIABETES MEDICINE, you are at an increased risk of becoming hypoglycemic (low blood sugar). Signs of hypoglycemia include an increased heartbeat, headache, sweating, tremor, increased hunger, changes in vision, nervousness, or tiredness. Discuss with your doctor or nurse how to handle hypoglycemic reactions. KEEP ALL DOCTOR AND LABORATORY APPOINTMENTS while you are using Actos (Pioglitazone). BEFORE YOU HAVE ANY MEDICAL OR DENTAL TREATMENTS, EMERGENCY CARE, OR SURGERY, tell the doctor or dentist that you are using Actos (Pioglitazone). BEFORE YOU BEGIN TAKING ANY NEW MEDICINE, either prescription or over-the-counter, check with your doctor or pharmacist. FOR WOMEN TAKING BIRTH CONTROL PILLS: Actos (Pioglitazone) may decrease the effectiveness of your birth control pill. To prevent pregnancy, use an additional form of birth control. FOR WOMEN: Actos (Pioglitazone) may increase your chance of pregnancy by causing ovulation to resume in premenopausal women who have not been ovulating. IF YOU PLAN ON BECOMING PREGNANT, discuss with your doctor the benefits and risks of using Actos (Pioglitazone) during pregnancy. IT IS UNKNOWN IF Actos (Pioglitazone) IS EXCRETED in breast milk. DO NOT BREAST-FEED while taking Actos (Pioglitazone). Possible Actos Side Effects: Actos SIDE EFFECT that may occur while taking Actos (Pioglitazone) is sore throat. If it continues or is bothersome, check with your doctor. CONTACT YOUR DOCTOR IMMEDIATELY if you experience the following side effects: bloating or swelling of ankles, feet, or hands; chest pain; rapid weight gain; shortness of breath; fatigue; unexplained nausea or vomiting; stomach pain; loss of appetite; unusual thirst; unusual amount of urine; dark urine; or yellowing of the skin or eyes. If you notice other effects not listed above, contact your doctor, nurse, or pharmacist.